Feral swine are causing yet another problem for South Carolina's natural resources, this time by interfering with prescribed burning. According to Johnny Stowe, S.C. Department of Natural Resources (DNR) wildlife biologist, forester and prescribed fire manager, "Feral pigs are invasive, non-native vermin that disturb vegetation on the ground as they wallow and root for food, resulting in patches of bare soil that disrupt our ability to get fire to carry continuously across areas being burned." Prescribed fire managers tend to light fires in continuous lines, or else to ignite "spot" fires, and then rely on these fires to carry over the rest of the site. But when these fires reach areas where hogs have trampled, rooted and wallowed in the leaves and grasses and other fine fuels that carry the fire, the fire goes out. This often results in large areas not being burned. Sweetgum, red maple and other undesirable hardwoods often then grow up in these unburned patches, further degrading wildlife habitat. Stowe says that one of the main reasons that feral pigs are so destructive is that they are not native to North America, and so they do not have any natural predators or other environmental factors to limit their populations. Jamie Dozier, DNR wildlife biologist and manager of the Tom Yawkey Wildlife Center, says, "Feral swine are pests that impact a wide variety of wildlife species. In some years they have destroyed more than 90 percent of the nests of the federally threatened loggerhead sea turtle on the North Island portion of the Tom Yawkey Wildlife Center. This species has been in sharp decline in past years. Feral pigs have also been observed rooting in least tern colonies and areas associated with Wilson's plover and American oystercatcher nesting." Billy Dukes, DNR chief of wildlife, says, "The department has taken significant steps in the last few years to increase opportunities for hunters and farmers to kill these pests, including allowing limited night hunting. This opportunity carries several restrictions put into place to protect deer and other natural resources and provide for public safety. Hunters must notify DNR and provide certain information before hunting feral swine at night." More information on hunting hogs at night can be found at www.dnr.sc.gov/nighthunt/. 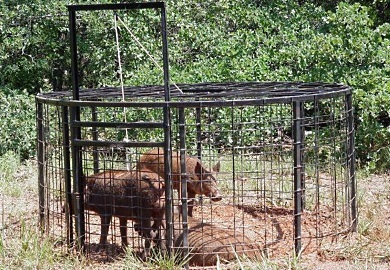 Feral pigs cause many other problems for the state's natural and agricultural resources, including: consuming or trampling rare plants and longleaf pine seedlings, peanuts and other crops, and acorns and other important foods used by deer, turkey and other native wildlife species. Feral pigs also prey on ground-nesting birds, and on amphibians and reptiles; contaminate water sources, and serve as potential vectors for diseases that are harmful to people and domestic swine. For more information on feral swine see www.dnr.sc.gov/wildlife/hog/damage.html.